When the small federal style adobe courthouse in the center of Brigham City was built in 1856-57, it was planned to house church, social, and government functions. By the time it was completed, Box Elder had been officially designated a county, but its fledgling government left plenty of room for all those functions. 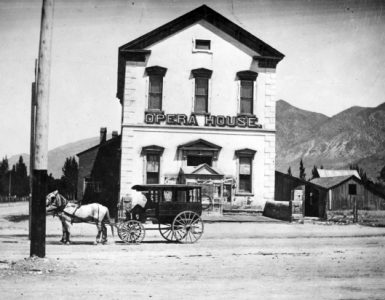 Church services, dramatic productions, school classes, social events, and the Brigham City Council all occupied space in the city’s first public building. The general trend of courthouse architecture has been from simple to more complex. Many of the first courthouses were boxlike rectangular buildings with restrained classical detailing on the exterior and a single room on the interior. They often served multiple purposes in a community, housing civic, social, and even religious functions. Later, as counties became more populous and the role of government more pervasive, courthouses became larger and more complex.1Roger Roper, “County Courthouses of Utah–A Photographic Essay” Utah Historical Quarterly, Utah State Historical Society, Summer 1993, 259. As County government functions grew, so did the city and its institutions, providing new venues for community life. 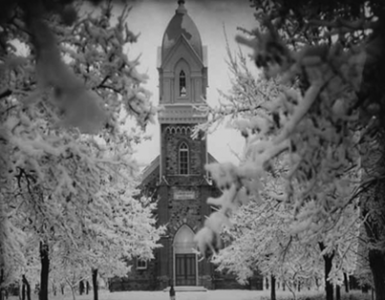 Church meetings moved to the tabernacle, the Co-op built a combination store and social hall, and the four newly-created wards were each to build a school and a meeting house, cutting down on the need for use of the courthouse by other groups. By the mid-1880s, county officials felt the need to make improvements. The plain 30-year-old adobe courthouse didn’t look as auspicious as it had when it was the only substantial building in the center of the city, so plans were made to give it a more stately appearance. On February 18, 1887, a Model #15 tower clock was purchased from the Seth Thomas Clock Company’s Chicago store for $433.15. The 927-pound clock was shipped to Brigham City and was received by Lars C. Christensen, who became the inspector for the community timepiece. After its installation in the Box Elder County Courthouse, the clock functioned until sometime after World War II.3Tower Clock Unveiling, a program printed for the occasion by the Brigham City Main Street program, August 12, 1996. At this time the clock was fully restored to its original grandeur and working condition. Now, where are these quarters to be? There isn’t a square foot of room in the court house that isn’t occupied. The quarters of some of the officers already domiciled there are so small that it is a shame. For instance, the assessor hasn’t room to turn around in his office, and the attorney is but little better off.4Box Elder News, Brigham City, UT, July 18, 1907, p1. 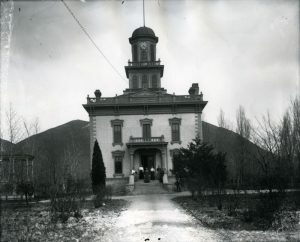 The idea of a courthouse addition was not popular with the west side of the county, some of whose residents saw it as politicians wanting to spend more in Brigham City, to which the News replied: “The courthouse as it now stands was built almost entirely by Brigham City people” and went on to quote some living pioneers telling of working without pay and making voluntary contributions.5Box Elder News, July 17, 1907. The News continued its campaign through the next two years, noting, “A few short years ago the county clerk’s office was smaller than it is now, but was sufficient”, the need for a woman’s room, lack of a jury room, a courtroom “altogether too small”, a recorder’s officer “entirely insufficient” with no room for the public and “books so numerous” there was hardly any desk room.6Box Elder News issues from September through December, 1907. A letter entitled “Let Us Reason Together” published early in 1909, cited the inadequacies of the courthouse, stating that the “stenographer’s office is a kind of three-corner affair”, and that the School Board had to rent offices at First National Bank. It declared “a corporation representing ten millions of property is certainly entitled to better accommodations.”7Box Elder News, February 18, 1909. County Commissioners (The body was called County Court at the time) were aware of the space deficiency, and began to plan accordingly. In July 1909, they authorized Andrew Funk to “draw up plans and specifications for an addition to the courthouse”.8Box Elder News, July 8, 1910. At the regular meeting of the County Commissioners held in the Court House last Monday, the plans and specifications for the proposed new court house were accepted and the order given to advertise for bids. The plans were prepared by Funk & Wells, the local architects, and call for a handsome building or addition. The new building will be erected on the west end of the present court house. The rooms will be conveniently arranged and when the addition is completed the county officials will have ample space to move about, which will also be a great convenience to the public generally having business in the new court house. The new court house is something the county has need for a long time . . .”9Box Elder News, “The New Courthouse,” January 20, 1910. Architectural styles for twentieth-century courthouses were derived from both historical and modern sources. The Neoclassical Revival style of the early 1900s (good examples include those in Utah and Box Elder counties) was a more elaborate expression of the simple classicism of Utah’s first courthouses… Twentieth-century courthouses tended to be larger than those built in the 1800s, reflecting again the growth of population and government. A number constructed in the 1910-30s replaced earlier buildings that were too small or outmoded for modern county operations.10Roper, p 261. By early March, it was reported: “Messrs. Sackett and Lindholm have secured their bond and are now prepared to proceed with the work the erecting the new courthouse. The bond was taken up by Figgins & Phillips, the amount being $28,760.50, which represents just half of the contract price of the building.”11Box Elder News, March 3, 1909. While the building was being erected, an entrance to the existing courthouse was made in the south side. The new building would be independent of the old courthouse, but when finished the two would be connected, providing “plenty of room for years to come” as well as a handsome building. Progress was followed closely by the local newspapers, as the cement foundation was poured, the second floor placed, brickwork completed, and installation of “metal coping, which gives the building an artistic appearance. Soon the handsome stone columns will be placed in position for the portico which will be the finishing work on the outside.” 12Box Elder News, November 3, 1910. A couple of weeks later, spectators gathered downtown to watch the raising of the columns, as reported on November 17, 1910: “The handsome stone columns and caps are now in place at the top of the steps to the main entrance . . . There has much interest in the erecting of the columns, which was done by John H. Bott with his huge derrick. The building is now beginning to assume the beautiful lines which the architects intended it should.”13Box Elder News, November 17, 1910. By January, architect Wells was instructed to make the opening between the old and new building on the first floor the full size of the hall, if necessary.14Box Elder News, January 5, 1911. Bids for repairing the two east rooms on the first floor of the old courthouse were let. By April a contract was signed for connecting electric wiring, and the clerk was asked to contact the telephone company to remove wires for the old tower.15Box Elder News, March 6, 1911. During this period, Brigham City was building a new Fire Station and City Hall, the MIA Library was moved, and a new street was being surveyed to run east and west north of the new public buildings. The County Court worked with the City Council in coordinating plans for sidewalks and landscaping for what would be a city-county square. The groundskeeper was “digging up a row of trees just inside the west fence” since they “almost completely hid” the magnificent new building. Another matter concerned the city town clock. The bell had been taken down and broken into five pieces prior to shipping it back to the foundry for repairs. While the bell was away, the county clockworks were to be transferred from the old courthouse tower to the new tower to provide citizens with a public clock tower. The old bell tower was razed and the roof of the old building restructured to fit the line of the new structure.16Box Elder News, March 13, 1911. Although the building was not yet in use, the new courthouse flagpole was used for the first time in celebration of the Fourth of July, 1911. Within a week, a newspaper “building notes” column stated: “The county officials expect to move into the new courthouse within the present month, if all goes well” and that the floors were being oiled. County Court minutes through summer and fall continued to record tree removals, sidewalk construction, contracts for steel fixtures and furniture. With its classical columns, wide front portico and stairway, the three-story Court House was visible from the Depot at the end of West Forest Street. Its three stories included a half-basement with entrances underneath the wide front steps, a main floor and a top floor, plus the handsome bell tower centered on the new portion, fronting the attached original courthouse. 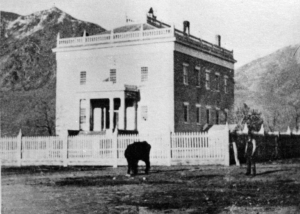 As noted by Roper: “ Though dominated by its 1910 Neoclassical front section, the building includes the original 1857 structure, making it the oldest remaining courthouse in Utah.”17Roper, p 262. By the end of this week, if all goes well, the new County Court House will be occupied by the various county and district officials . . . Upon entering the building, the first door to the left opens to the clerk’s office. These apartments occupy the north west corner of the first floor, part of the big room having been partitioned off to give a quiet corner for the copyists. In this same suite is a splendid big vault which occupies the south east corner of the space north of the hall. The clerk has a private entrance to his apartments, and the general public will not be supposed to get any farther in the rooms than the big counter which extends from wall to wall. On the right of the hall, is the district court room and judge’s chambers. The court room is a large well lighted room occupying the east half of the space, and the judge’s chambers are on the west end, the first door to the right upon entering the building. The main stairway leading to the second floor occupies part of the space on the south side of the main hall also. From the district court room, a private stairway leads down to the basement into the sheriff’s offices, consisting of two rooms on the west end with a spacious room taking up the balance of space on the east, which will be used as a jury room. The convenience of this arrangement is apparent, for it gives the sheriff a passage though which he can bring and take prisoners and the jury independent of the spectators of general public and can under all circumstances keep his charges apart from other people. From the sheriff’s offices there is an exit to the outside under the steps leading up to the main floor of the building and from the jury room there is an exit on the east so that individuals who must be kept away from the association of their fellows for a reason can easily be handled without inconveniencing anyone. The entire north part of the basement will be occupied by the recorder. The basement rooms are very pleasant, the many windows admitting plenty of light and fresh air and in the summer time the temperature will never get very high and in the winter never get very low. The recorder will have a spacious office to accommodate the public, a copy room for the copyists, two large fire proof vaults and a cozy room off by itself and away from the copyists and public, for the abstractors. Leading up to the main floor is a spacious stairway on the south of the hall, and the basement has an exit to the outside, under the steps. On the second or top floor, will be located the district attorney’s and county attorney’s offices. They will occupy the south portion of the building, the district attorney having his quarters on the east end, three splendid rooms, and the county attorney on the west end with three splendid rooms, both suites having an entrance to the main hallway. Across the hall on the north side in the north west part, the commissioners have splendid apartments consisting of two large rooms. The first one will be a sort of a lobby for the general public who have business with the commissioners, and in the inner room the County Dads will rest their bodies in comfortable swinging arm chairs with high backs and well padded seats, as they grind out the business pertaining to the county welfare. To the east of the commissioners apartments is a large room which will be fitted up for the justice of the peace and juvenile court and it will be an ideal room for that purpose. The rooms now occupied by the Recorder and Clerk will be made into one, or at least they will be connected by an entrance through the wall that separates them, and those rooms will be occupied by the Treasurer. The Assessor will be moved down into the present quarters of the Treasurer. On the top floor of the old building, will be the old District Court room, Assessors room, Commissioners room, Sheriff’s room, and the Judge’s apartments, which will either be fitted up for the Board of Education or some other purpose. But when the officials finally get located in their new quarters, everybody will have all the room they need and the public can be given better attention which has been seriously hampered in the past because of lack of room. The Court House is a credit to Box Elder County, and is a monument to Messrs. Funk & Wells, who designed and supervised its construction.18Box Elder News, November 9, 1911. With the exception of relocation of the Sheriff’s office to a new county jail and addition of a small display area for use by the Daughters of Utah Pioneers in the basement, most of these assigned offices (including the Board of Education) were still in the same general location in the Court House up through to the 1950s, along with its interior stairways and ornate oak woodwork. Somewhat hidden as it may be after a 1910 expansion and new neoclassical front, the original adobe courthouse remains visible at the back and is still in use as county government offices, making it the oldest remaining courthouse in Utah.19Roper, 262.